Types of Mushrooms: Which One to Grow? Are you wondering which types of mushrooms to start growing? Whether you're seasoned at cultivating mushrooms or just starting out, there are some things to think about before you decide. If you're a beginner, start out by growing oyster mushrooms. Oyster mushroom mycelium grows vigorously and will survive a wide range of temperatures. Oysters are generally thought to be one of the easiest types of homegrown mushrooms. Another popular choice is shiitake. Shiitake mushrooms are both easy to grow and delicious. They're great if you're just getting started with log cultivation. For other mushrooms, one thing to ponder is the time of year that you're planning on starting and ending your project. Different mushrooms fruit in different seasons, so matching your mushroom to its preferred season will give you the best success. Your methods and materials are other factors to consider. Will you grow mushrooms on wood or straw, paper or compost? Certain species do better on certain substrates, and it pays to know this before you begin. Below we'll go into more depth on thinking about the right season, as well as taking into account your materials. We'll end with some info on growing mycorrhizal mushrooms. Sound like a lot to think about? Don't feel overwhelmed. The ultimate point here is fun, and a little planning now will result in a delicious and rewarding mushroom growing experience! 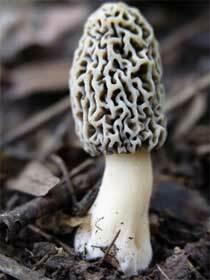 Due to its popularity, the topic of growing morel mushrooms has its own page here. The season can play a big role in your choice of which species to grow. Different types of mushrooms fruit at different times of year, so knowing this is important to your timeline. An outdoor straw bed planted in early summer can be ready by late summer, so a summer or fall mushroom would be a good choice. If you're planning on growing morel mushrooms you should be aware that they fruit in the spring. So starting your patch the year before and knowing where the ground freezes is important. Thus you can see how the season dictates when your mushrooms will fruit, and how you have to plan for that. Reishi mushrooms fruit in the summer, so you can surmise that they like it pretty warm. Adjust the temperature of the room they're in accordingly. Spring oyster mushrooms fruit in, you guessed it, the spring. Your grow room doesn't need to be as warm, so they're a good choice for cold climates. Below is a list of when some popular types of homegrown mushrooms fruit. This list isn't set in stone, but it's a good place to start. A final note is that "season" is relative depending on where you live. Your summer may be short. Or the temperature of your winters may rarely go below 40 degrees (lucky you!). Keep your local area in mind and use this list as a general guide. Which Method to Grow Different Types of Mushrooms? The method you use to grow mushrooms is another factor to consider. Some types of mushrooms grow better on wood; others are faster and easier with straw. That said, there are no real hard and fast rules saying you must grow certain types of mushrooms a certain way. Yet you should keep your method and materials in mind when selecting a species. Cultivating mushrooms is dependent on the amount of time, money, and effort that you have to put in. 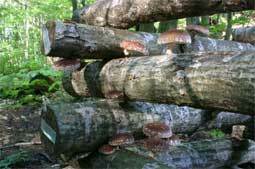 If you're just starting out with log cultivation, shiitake are a good choice. They're easy, versatile, and not too picky about the kind of wood that they like. Maitake and reishi are a little harder, so you may want to save them for when you're a little more experienced. Again, these are suggestions, not rules. Shiitake mushrooms don't have to be grown on wood, they will grow on straw. Likewise you can try your hand with enokitake on wood chip beds. This list just shows how the types of mushrooms you want may impact your choice of materials and vice versa. It pays to do some research on your chosen mushroom as to what it the best way to grow it. If materials and time are an issue, don't overlook mushroom growing kits as a method for producing tasty treats. Read more about mushroom kits in this article. For what I recommend, check out all the various mushroom kits on Amazon . Most of the hard work of preparing spawn and substrate has already been done for you, so all you need to do is choose your species. They have a great selection from shiitake mushrooms to oysters, reishi, and more. Read my review of the shiitake mushroom growing kit from Amazon.com here. What makes these mycorrhizal mushrooms special? Their mycelia enter into a beneficial symbiotic relationship with the roots of plants and trees. This gives the plants additional moisture and nutrients, while giving the mycelia access to sugars. Inject spores directly into the roots. Create a spore slurry and spread it at the base of trees. See instructions on how to do this here. Plant seedlings of young trees near a spot that already has mycorrhizal mushrooms naturally fruiting. For these methods to actually work you'll need the right species of tree, some patience, and a lot of luck. It's difficult to cultivate certain mushrooms, but not impossible. It's certainly worth the effort to do some quick experiments! For more information on cultivating these types of mushrooms I recommend Growing Gourmet and Medicinal Mushrooms by Paul Stamets. Hopefully this article has given you more to think about when choosing types of mushrooms to grow. Now make your decision and start growing!